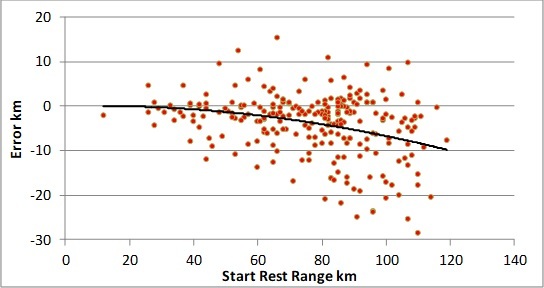 This graph shows the error in the rest or remaining range (RR) predicted by the car. Each dot is a "trip" consisting of continuous data. I found them by dividing my recorded data into trips in which the largest change in the odometer (odo) or the RR was 1 km. This means that larger changes such as turning on or off the heater or the AC marked a new trip. If data collection stopped this was marked as the end of a trip. This resulted in about 300 trips. For each trip I subtracted the start odo from the end odo to get the number of km driven. To get the true number of km driven I reduced the odo km driven by 5% based on experience. Then, I removed all trips less than 5 km because I figured that they were of no interest. 240 trips remained. After that I subtracted the end RR from the start RR to get the number RR km used for each trip. Finally I subtracted the RR used from the true km driven to find the error. 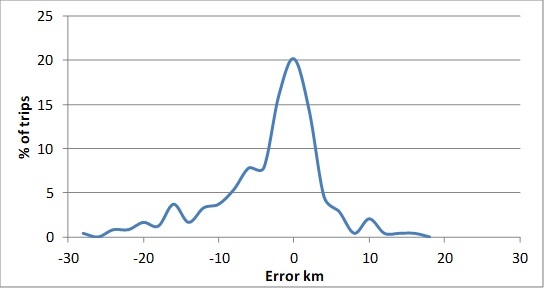 This means that if the km driven were greater than the RR km used the error is positive. As you can see the reverse is more often true. I used more RR km than the true km driven. For the longest trips the average error was about -10 km. 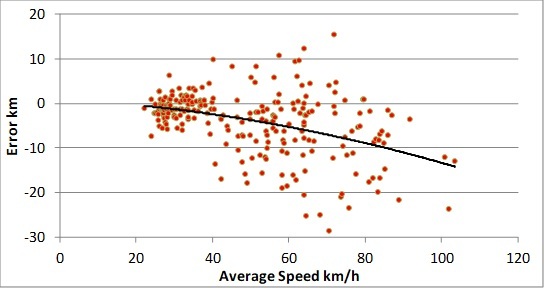 The next graph shows the error as a function of the average speed for each trip. As expected I ate up the RR at high speed. This is a graph of the error as a function of the predicted RR at the start of each trip. The reassuring thing here is that as the RR gets smaller both the accuracy and the precision of the prediction improves. So if there is only a 10 km left in the battery and you are worried about making it home the RR is more dependable. The impression I got form the graphs above is that the error is large but actually it isn’t as bad as it looks. This graph shows the distribution of the errors. 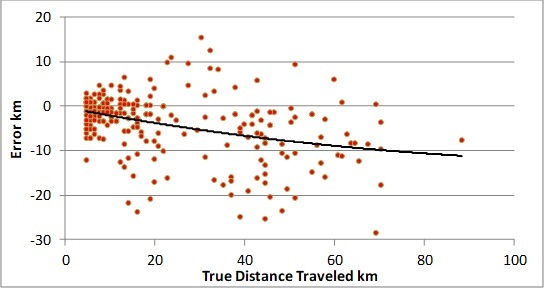 The most frequent difference between RR km used and true driven km is in fact 0. 20% of the time there is practically no error. About half the errors are between -5 and +5 km and 2/3 of the errors are between -10 and +10 km. That's interesting data, especially the distribution curve. RR shows range till 10% remainig capacity!!! when RR shows --- km, then there is 10% left. Turtle light comes on at 8,5%. Sometimes car stops @ 4,5%. So if the car often stops moving at 4.5%, then the RR is actually showing range 'til 5.5% and not 10% I find in my two cars over the past 6+ years, how far the car will go after zero RR appears to be a constantly decreasing number - When they were new, I could go 6 or 7 miles at 45 or 50 mph without worry - Sure can't do that anymore! CZeroOwner, thank you very much for the plots - always fun to look at numbers and see how data is presented. First off, as you know the predictions are based on a moving average of the consumption of the preceding 24km (15 miles), excluding heating/aircon usage. Although heating reduces the displayed RR by approximately 20% and aircon by about 10%, it's my understanding that the actual consumption does not enter into the predictive algorithm. As we all know, variations in speed, altitude, head/tailwind, leadfoot vs. featherfoot, etc. can dramatically alter our consumption and thus, eventually, the RR display. In my case, I've had full-charge RR variations between 40 miles to over 80 miles. That said, I rely on RR as simply another datapoint, mentally compensating knowing the conditions I had driven in for the past 15 miles. I feel that the consistency of our display makes it certainly better than whatever are the convoluted algorithms in the Leaf and Bolt GOMs. Having a GPS in front of me with the destination dialed in on any longer trips makes it very easy to compare the RR with the GPS distance to destination and as long as RR is larger, no problem. It's especially valuable at the lower end of the scale, although I have personally never seen zero RR nor turtle. Best at predicting is the Tesla, which is uncanny in very accurately predicting the remaining SoC at the destination over incredible distances after one enters the destination into their nav system! I's my understanding that their algorithm takes into account many variables, among them being speed over that particular stretch, altitude, interior temperature, exterior temperature, and (I was told by a Tesla rep) headwinds/tailwinds anticipated over the course. Notably, it does NOT take driver's past performance into account. RR shows range till 10%! I have constantly monitored that with Hobdrive app + ELM327. 10,5% charge - RR shows ~ 1km left. Maybe there is difference between EU and USA models. I usually plan my trips counting that reserve after " - - - km "